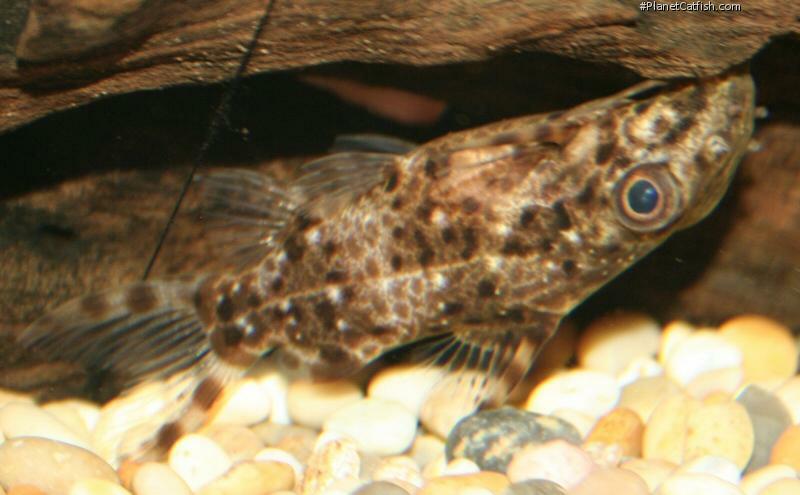 Synodontis contractus comes from the Congo region of Africa, (Stanley Pool) near Kinshasa. It the smallest species of Synodontis, growing no larger than eight centimetres; it is, somewhat incorrectly, also know as 'David's' Upside-down Catfish, having been described in synonymy by Herbert Axelrod in 1970. It also has another unflattering common name of 'The Bug-eyed Squeaker' (USA) derived from its large eyes and the squeaking noise it makes when captured. It has a very mild temperament, which means it would be an ideally suited tank mate for almost any community aquarium. Being a social species, it would be best kept in small groups of three or four of its find. It is very similar in colour pattern and spends most of its time swimming inverted, like the more commonly encountered Synodontis nigriventris David, 1936. The main differences being that Synodontis contractus has a bigger head, broader mouth and far larger eye. It would not be the first time that this fish has been described as ugly, but that's all in the eye of the beholder. This is pretty much a nocturnal species spending most of the daylight hours in hiding, tucked away in shady areas, quite often in an inverted position amongst the vegetation, under fallen branches or pieces of driftwood. When first imported this fish can be extremely delicate and may take a little time to become acclimatised, however once settled they are relatively easy to maintain. Providing an environment close to their natural habitat will help speed up the settling process. Using a sandy substrate, their aquarium should be furnished with pieces of bogwood, some largish stones or pieces of rock and have densely planted areas. The use of some large leafed plants like Anubias and Echinodorus, are especially good because of their large overhanging leaves, which will afford ideal roosting places. Floating plants will also add good cover and subdue the light. The natural diet of Synodontis contractus consists mainly of insect larvae, which they search for under overhanging leaves and in the bio-film that forms on rocks, fallen branches and tree roots. They also spend a lot of time upside down grazing on the surface plankton. In aquaria they will readily accept frozen foods such as Daphnia and bloodworm, as well as commercially prepared tablet, granular or flake foods. Although considered nocturnal, given the right conditions this fascinating little fish can be observed quietly moving around in the shady areas of a well-decorated aquarium. Given the right conditions it is possible to induce this species to breed. My own group of three have produced one batch of thirty, large (3.0 mm diameter) bright orange eggs, these were hidden away high in a back corner of the aquarium and were accidentally moved while cleaning a side glass, which resulted in their failure to hatch. Our thanks go to Catfish Study Group (UK)'s chairman, Ian Fuller, for this months feature. Type Locality Rubi R. at Buta, Zaire. It is very similar in colour pattern to the more commonly encountered Synodontis nigriventris. The main differences being that S. contracta has a bigger head, broader mouth and far larger eye. Sexing Unknown, hard to tell differences in genital papillae in such a small species. General Remarks Males reach no larger than 70mm SL. Distribution Africa: Congo region (Stanley Pool) at Kinshasa. Feeding Live foods, frozen foods, tablet, granulated and flake foods. The species is fond of snails and some vegetable matter should be included in the diet. Furniture Well planted tank would best suit this fish as it lives in this type of habitat in the wild over muddy substrate. Compatibility A peaceful species even with its own kind. Suggested Tankmates Most small to medium sized community fishes. African tetras would be the most appropriate. This species is found in large shoals in the wild and should be kept in a group of at least 3 or 4 individuals preferably more. Breeding Although not hatched, at least one aquarium spawning has been encountered. A small group produced one batch of thirty, large (3.0 mm diameter) bright orange eggs, these were hidden away at the back of the tank.